1. Micro-crystal formula for 5X the shine of patent leather. 2. Plush applicator shaped to curves of your lips for smooth, even application of color. 3. 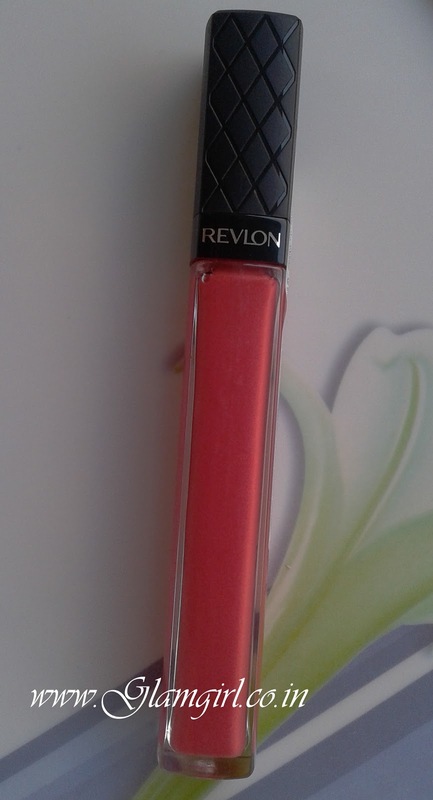 Revlon ColorBurst’s Elasticolor™ technology for rich color with a weightless feel. Do you like orange lippies or glosses? Orange lip color adds warmth to face. Some time you feel that you are looking dull/pale because of tiredness or less sleep go for corals and oranges, it will instantly brighten up your face. These days, I am kind of obsessed with oranges and I love the warm glow in this cool weather. Revlon lippis play fairly well. There are many color options in this range. These glosses are highly pigmented. I prefer to call them high shine liquid lipcolors rather than a gloss. It comes in a long tube, with brush applicator. Its brush doesn’t hold too much of the product but the right quantity and facilitates easy application. If I compare this gloss with others, it stays longer. Color stays even after meals, so lips look pigmented. I recommend it: to medium to fair skin color beauties. This color may not suit dusky beauties.